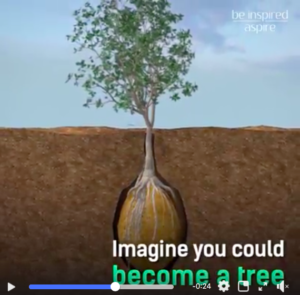 Of the many innovative human burial concepts I’m aware of, the one that interests me most right now is the method of turning your corpse into a tree. A concept by Anna Citelli and Raoul Bretzel called Capsula Mundi envisions trees growing from decomposing burial pods. Trees or tree seeds would be planted on top of a corpse in fetal position encased in a biodegradable egg-shaped pod. Citelli and Bretzel hope that some day cemeteries with headstones will be replaced with entire forests of dead-people trees. Doesn’t this seem a fitting way to commemorate a person’s entire his-tree? Wouldn’t such symbolism constitute a kind of po-e-tree? Instead of deciding whether to have a coffin made of oak, cherry, or walnut, you could decide which of these trees you’d like to become. Imagine all the opportunities of suiting the tree to the person: for prickly people, spiky locust trees; for offbeat relatives, nuts; for the nicest people, real peaches and plums; for rich women, firs; and for bonded couples who die at the same time, a single pear. Was the person a misanthrope, a sourpuss? Imagine his delight at becoming a hackberry, mulberry, or Chinese cherry; having birds eat his fruit; and then crapping all over people’s cars. Wouldn’t that just make his eternal day? Maybe you died forgotten and alone, but with this technique, even in death it’s not too late for you to become poplar. I myself think I’d like to become a fruit tree, say an apple—a sweet apple tree so that people would say, “Bill’s bark is worse than his bite.” Though dead, I’d still be fruitful. I could become a pie, a cobbler, or a streudel. Why, I could fritter away the afterlife. Though decomposing, I could still have a peel. I could be saucy. I could be hard apple cider and be as intoxicating as ever. I could work on my core. And I’d still be in people’s lives: An apple a day keeps Bill Spencer in play. I could symbolically say, “Eat me!” And anyone who did would be guilty of can-apple-ism. As an apple tree, I think I could continue to grow—as a person—if I apple-ied myself. I think I could really flower. And once I was established, I could branch out. Every spring my sap would rise, and every autumn I’d get more colorful. And I’d try to get my wife to become an apple tree, too, planted as nearby as possible. We could spend our whole deaths together. She’d continue to be the apple of my eye. I could be a Gala, and she could be my Honeycrisp. Both apples but with our distinct differences. Two varieties of the same fruit. And I’d be very happy because even after we’re dead, we could still cross-pollinate. My thanks to Wildacres Retreat, where this essay was written. and it would partake of the essence of me…..
My girlfriend would refuse to eat the raspberries from the tall bushes of them in a nearby graveyard because she thought they would have bodily and embalming juices in them from the bodies there. I love the lyrics. Thanks for posting them. As for your girlfriend, that’s berry sad. Just put me in Muir Woods. Anywhere there will do. Millions would visit you just to be in your presence and look at you in awe. 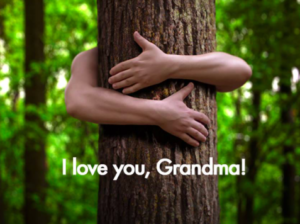 May the forest be with you. Can I be one of those giant Redwoods to make up for my stature in real life? Donna, you are a towering presence NOW! Even when I’m dead, I’ll be rooting for you, Bill Y.